Google Analytics(tm) is the most used analytics platform in the world. Before, only AdWords data was available in your dashboard. Analyze.ly automatically uploads your costs from Facebook, Bing and other sources. Time is priceless, and Analyze.ly can help you spend more time analyzing and less time jumping between different systems and tools by automatically integrating your ad campaigns into GA. Your data is received and uploaded using an SSL. No data is retained after the upload is complete, ensuring data privacy. We natively support Facebook, Bing, Yandex and Baidu to import cost data into Google Analytics. We can support any data source via custom data upload functionality. All you need is a login to your GA account and either login credentials for each advertising network or data files that you can simply email to Analyze.ly for processing. Currently Analyze.ly supports (S)FTP and data files via inbound emails. We are working on more integrations options that we will announce shortly. 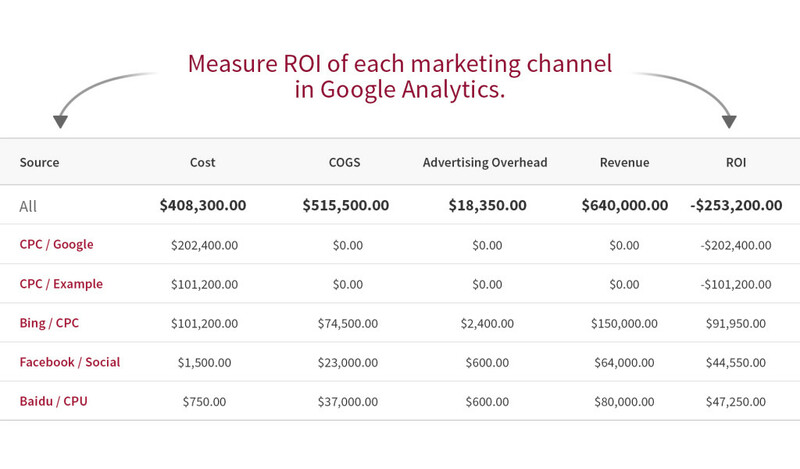 Compare ad costs and conversions side by side in Google Analytics to drive conversions up and acquisition cost down.